Well this was a long time coming..! It seems so long ago that series 19 began airing, and its whole scheduling was an absolute farce, but with the final episodes (finally) being released last November, it's high time to give it one final examination. 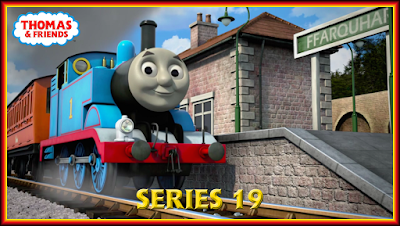 Rather than order the episodes by air/release date order, I'll be doing what I did with series 18's overview and ordering them from worst to best. All of the reviews to individual episodes can be accessed by clicking the pictorial header related to said episodes. This post will be going over my general, quick thoughts while clarifying certain aspects of the reviews that may need to be. Yep, I hate this episode more than Big Belle, Fiery Flynn and Race to the Rescue. Why? Because I expected better from this team. Simple as that. Looking back, it seemed a bit stupid to expect anything more than mediocrity from the episodes I mentioned. Even forgetting the "hindsight" argument, the repetitive dialogue and situations, dull scenarios and (as of series 15) rhyming should have been a huge giveaway (as well as their lackadaisical attitude to safety in Wonky Whistle and Kevin the Steamie). But the current team have done so much better. The storytelling has vastly improved, the annoying dialogue (except steamie) has gone and the characters, including the Search and Rescue team, actually feel like characters. They didn't gain those characterisations in this series either, but in Too Many Fire Engines. Two years ago. I said it in the review, but had this taken place in series 17, and had it actually been this team's first attempt with the rescue crew, I'd have been lenient towards it. But with so many great episodes - written by them - featuring these characters, it hurt this one more. It still would've been bad back then, but if it lead to Too Many Fire Engines, Toad & the Whale and Wild Water Rescue, it would've been forgivable as the team would be ironing out of Flynn, Belle, Butch and Harold's teamwork issues and characters so they can become a proper team that the island, and fans, could be proud of. A bit of behind the scenes insight for you: I originally gave this episode a 2. But as I wrote my final thoughts on it, the major flaw with it came to me, and I settled on this score. Many are rather surprised that I rated this lower than an episode that I've been more critical of. But even they had a point of them. 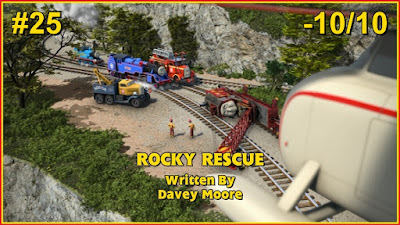 Heck, Rocky Rescue had some point, and that was atrocious. This had no point whatsoever. There's no character and no initiative taken (yes, I know some will say "but if they did that, there'd be no story", but that's the whole point. If the solution to an issue is this easy to figure out, you should re-consider finishing the story); it's the definition of filler content. There's a very easy way to make an "engines going on strike" plot work without copying Trouble in the Shed or making the solution very simple. 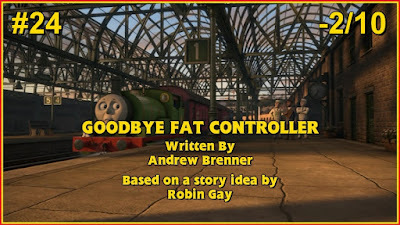 Have the engines cause one accident too many, then get the board of directors to replace the Fat Controller (which makes the title more relevant). But the new manager - who is rather detached from how things work on Sodor - gets things wrong at every turn. The engines decide to strike, leaving the new manager flustered until the Fat Controller is brought back to gain full control of the situation. The engines return to work, the Fat Controller is re-hired and all returns to normal. 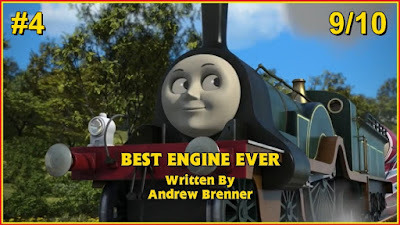 The only thing that salvages this is that it does a great job showing how much the engines care for the Fat Controller and the musical interlude was pretty fun. But that's it. The "miscommunication" plot trope has been done before, and done better, and the characters feeling interchangeable was really frustrating. I said it in the review, but this is creatively bankrupt as well. The only difference between this and Goodbye Fat Controller is that this had good characters (except Annie and Clarabel); Thomas and Bertie have always had good chemistry with each other. As for the crash, I actually kinda like it in a "so bad it's good" way. In terms of the story, it's the worst by far being ridiculously forced and contrived. But in terms of entertainment? Yeah, it's fun to watch the absurdity of it. It's just a shame that it's all part of a worse "remake" of Thomas' Shortcut. In series 20, Philip is great (so far). He has the childlike charm that I'm sure the team wanted to go for. This series though? Not really. He just felt far too annoying for my tastes. What doesn't help matters is that he's hardly ever punished for his actions, nor does he own up when he does something wrong. Honestly though, James felt worse than Philip. I get it; James has a big ego. he'd want to show off to the newcomer. But it's been 32 years by this point. You'd think his character would've developed slightly in that time so that his buttons weren't so easy to push. I'm not saying they should remove his vanity completely, but it honestly feels like it's his only character trait at this point. The plot was relatively fine though, and that crash was fantastic. The tension was great - you really thought he'd fall from the bridge, and James did learn a lesson (one he shouldn't need to learn, but I digress). But other than that, it was rather frustrating to watch. Capping off the bottom five is Philip's debut episode. Honestly, I still think this was an episode of two halves. The second one salvaged it, but if that was the first half and the second had Gordon get his revenge, the whole thing would've been better. What also helped was that Philip was actually handled rather well. He had charm at times, especially in the pointless first half, and he was told off for being unsafe (yep, because Gordon still being in steam when his boiler "exploded" isn't dangerous whatsoever). But as the episode progressed, he did get grating solely because no one really put him in his place, instead going along with him. I get that they don't want to be too hard on a child, but the fact is if you're not (at least) stern with a child, they won't ever learn. 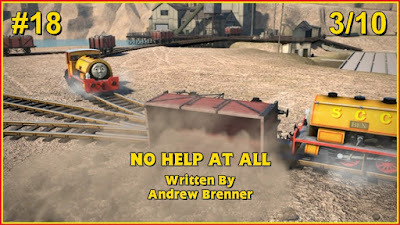 Gordon threatened to pay him out, but it was the last line of the episode, and the next moved the boxcab on to a different conflict, meaning there was no pay-off. At least Diesel 10's line in Misty Island Rescue led to his actions in Day of the Diesels. This is why Thomas' story, whether it be in book, model or CG form, is handled much better. Every time Thomas' cheekiness goes too far, he gets smacked down. And with every humbling, he learns to better himself, develop his character and gets the proper reward for his efforts. The Adventure Begins did a brilliant job with this especially as they had him help Henry overcome his fear of the rain. Sure, had they gone down this route with Philip, the comparisons would be coming in thick and fast, but at least his character wouldn't have suffered. This episode would be fine. Heck, if watched back to back with Hero of the Rails, it is fine (if incredibly jarring). But that's actually its biggest problem: like Rocky Rescue, it's completely out of place and rather pointless this far into the show. Remember Henry's Hero? 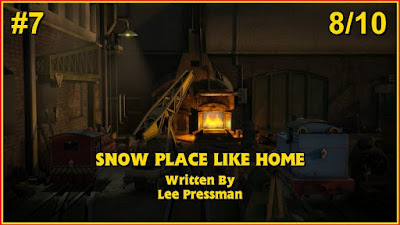 The one where Hiro battles through firebox troubles to get his jobs done? This episode doesn't. It references Hero of the Rails a lot, even going so far as to include footage from it in a flashback, but this episode? Nope. That actually makes this episode especially jarring as Thomas was his regular cheeky self there, but here he was obsessed with Hiro for... no real reason. They interact on a regular basis, why is he fanboying (for want of a better term) over Hiro now? Not only that, but why was there a concern that Hiro would need new parts when Henry's Hero proved they were well stocked? Especially in a hideout that had no parts left when Hiro was moved from it? Maybe if this was made clear that it was set after, and referenced, the series 17 episode (or just make the episode for series 17), this would've worked better, being mediocre than outright bad. The only real bright spot is that Thomas does try and make it up to Hiro by finding new parts. It's heartfelt; the kind of thing that Thomas' present day character would do. But that's really it. Had it been written for an earlier series, it would've had more, but it just felt pointless by the time it actually came around. But the biggest problem for me was a problem that plagued series 19 as a whole: Thomas' overexposure. His role here could've been given to literally anyone and the plot would've remained the same. Heck, it could've been given to Porter and Edward and we'd have had a better understanding of their dynamic (and probably a more heartfelt story). I'm not one to say that Thomas should never star in an episode, but it's called Thomas and Friends, meaning it's as much about them as it is him. And to revolve a series that was produced for the 70th anniversary of the franchise around him is a very narrow minded view of what made it so great in the first place. Sure, he made it recognisable (especially when the TV series began), but what made it great were the varied characters and the adventures they got themselves into. The story itself is fine. I like that Salty's storytelling caught up to him and giving him a personality flaw was fantastic. 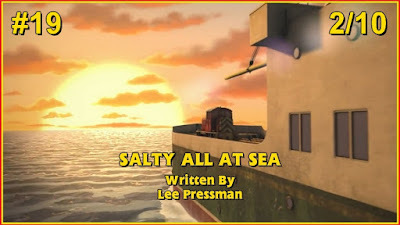 But with a better choice of characters, and a better ending, it could've been great; possibly Salty's best episode to date. This has similar problems to the previous episode on the list. The only thing that makes it marginally better is that Bill and Ben make it more entertaining. That said, they are also one of the issues with it. I won't go into them again as it was a very recent release (internationally at least; Japan released the UK dub a year ago), but the focus on them and a musical interlude left very little room for character development for the other two stars. The two stars, I must re-iterate, that needed it the most. Does anyone actually remember this one? If your answer is "no", then you've identified the major issue with it: it's boring and forgettable. The more I think about it though, the more I realise that this is similar to Marion & the Pipe, but it works a lot better as she can actually move on her own. That and she has more of a personality than just "angry old man". The only time this was entertaining was in No Sleep for Cranky; his reactions to Bill and Ben were brilliant. Here though, things just plod along at a slow pace, solely being content with being mediocre. There are a couple of slapstick moments which were good, but that's about it. Out of all the pointless episodes this series, this one got the highest rating as the story, despite being dull, is fairly solid; there are few flaws with it apart from the lack of entertainment value. The ending was anti-climatic, yes, but you're so bored when the episode reaches that point that you don't care how it ends. In hindsight, this episode did what it set out to do: finally rid Henry of his awful worrisome personality (that shouldn't really have existed after series 17; a series in which it was non-existent). That said, I stand by my review. As a standalone episode, this is better than Henry Spots Trouble. It's more entertaining, Henry shows genuine growth and Spencer played his role brilliantly. 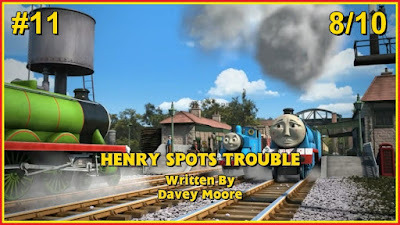 However, having this come hot off the heels of an episode where Henry went through a similar concept was not the best idea. Sure, the scheduling could be blamed for this, but I honestly think one of the stories (preferably Spots Trouble) should've been scrapped from the get go. It would've meant we got one less episode, sure, but at least Henry's character development would've been dealt with in one episode, not two. To be honest, an audience's enjoyment of this will come down to how many versions of A Christmas Carol they've seen. On its own merits, the story is so contrived that it's hard to really be invested in it anyway. The original story works fine because they're ghosts/spirits. They can appear wherever they want and no one need question it. 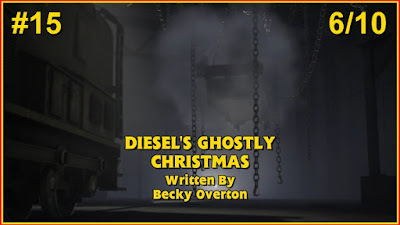 These are actual "living" characters pretending to be ghosts, meaning they had to hang around wherever they were needed until Diesel turned up. Not to mention the fact that he spent an entire night in a snowy field yet managed to work fine when he was re-railed. I'll get to it in my final thoughts, but the lack of consistency really hurt this series. I honestly think this is the laziest Christmas episode of the lot, and I'd genuinely give it a lower rating if I had the chance to review it again (I would've changed it here, but I wanted to keep this and the actual review scores as consistent as possible). 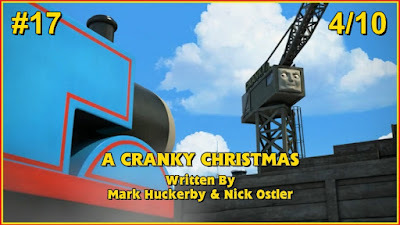 The plot is the most overdone one for a Christmas special, and even then, it's contrived as all hell. At least Diesel got some development, so it wasn't completely pointless. This is a fun episode to watch, but only if you care about football/soccer. 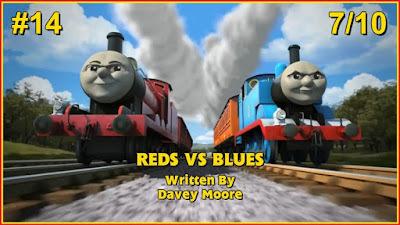 I honestly think more could have been done in terms of the red card (it's nice that engines are given a chance to change their behaviour, but actually punishing them there and then feels much more effective in terms of morals, the narrative and character development), but it was fine. Thomas and James' dynamic was also pretty fun. I quite like the competitiveness between the two, and although playing Thomas and Percy (if they had even half the character they had back in the day) or James and Gordon off against each other would probably be more fun, this was fine, too. I still think this is one of the better Toby episodes we've gotten since HiT took over, and it did everything right that Goodbye Fat Controller got wrong. First off, no one actually believed Salty when he first thought that Toby would be scrapped, and the rumour only spread when Thomas saw "evidence". 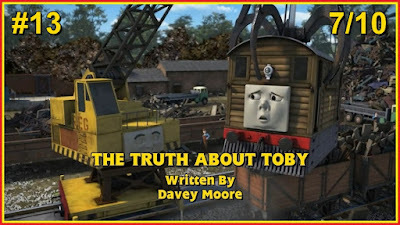 There are issues, chief of which Salty not being told off for starting the rumour in the first place (although Thomas' reaction when Toby wondered how it started was great) and the pacing isn't the smoothest. But it's still one of the better "don't believe everything you hear" stories produced for the show, especially for this series. You know how Pouty James is being lauded as one of series 20's best episodes because "it feels Railway Series-esque" when all they mean is "James' character has regressed to how it was in the early Railway Series books"? Well this does feel Railway Series-esque, but more from the mind of Christopher Awdry than his father. The characters are fine, and there's a nice variety of them, but the story itself feels really contrived. The inclusion of the roads made things feel fresh, but only seeing Bertie (and, eventually, the Thin Controller) made them feel bare. Add that to the repetition and you get an episode that's just fine. Not particularly memorable or anything, but it's fine. I really didn't like Henry's worrisome behaviour. But if they could make it fairly relatable for children, and fun enough for the adults to not be annoyed, I can give it a pass. 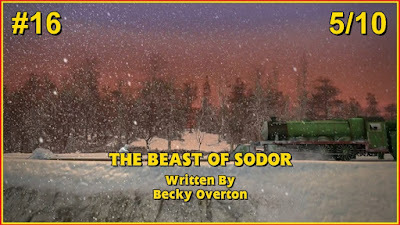 And since this episode was aired first, it's the one that I prefer, despite the fact The Beast of Sodor was the better episode in terms of his fear and the amazing turnaround of his character since that episode. There's not much more to say really. The review sums up my thoughts on it really well and my opinion now remains the same. 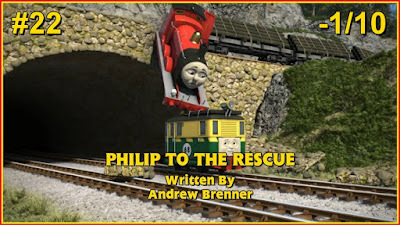 Although, as I said before, one of the two episodes should've been scrapped during the writing phase. It seems like forever that this episode aired..! And although my opinion on Thomas' current "character" has soured by quite a lot (especially when compared to what it once was), this was still a fairly good outing for him. 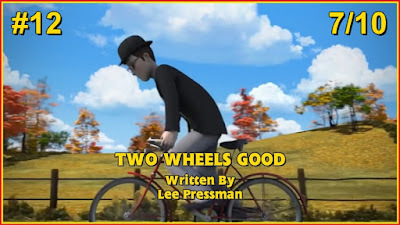 For the personality they wanted him to portray, the story worked well (and was a great set-up for Sodor's Legend of the Lost Treasure), there were some entertaining bits and the moral was well handled and a useful one for kids to learn. I still quite like Percy and the Calliope. There are a few reasons why, but the most relevant is Percy and Diesel's dynamic. They played off each other really well, and I was glad that the current team decided to give it a shot themselves. The two worked together brilliantly again, even more so here as Diesel wasn't just laughing at Percy's stupidity. Instead, he came up with a plan to do a job that Percy was given, Percy trusted him and then Diesel felt bad for getting him into trouble. It also helped that the rescue team were well written (for once, and not for the last time in this countdown), the episode itself was really entertaining and the narration wasn't overpowering; instead allowing the characters to shine more. 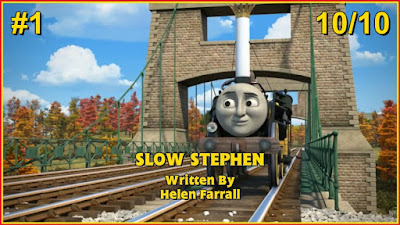 Helen Farrall has had an amazing couple of years, to the point where I honestly feel that she should be head writer of the show rather than Andrew. 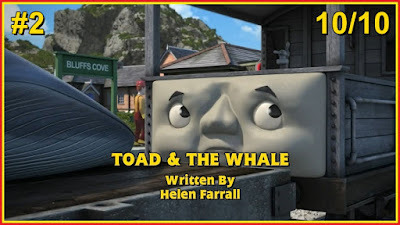 This episode isn't the main reason as to why her work is so special (we'll get to that soon enough), but it was the one that made me realise that she belonged on the team (even though Toad & the Whale aired before this). We all know how bad Wonky Whistle was. It's been called the worst episode of the show by a lot of fans, and while I think that it's rather over-hated these days, I still think it's pretty bad as well, and I was not wanting a re-write of it. But to my surprise, this episode fixed every issue that the former had. The only issue this had was that I found it a tad dull, but when the story is this strong and well written, it's a flaw that I can live with. Was anyone really wanting a Victor and Kevin story before series 19? Sure, Victor was a good character and Kevin was a semi-competent assistant, but it felt like that's as far as it could go. Thankfully, the team proved us wrong. I honestly think I underrated this one. It's so full of heart and charm that, in hindsight, it deserved a 9 or higher. Sure, Thomas could have, and probably should have, been replaced by another character who could handle the snow better (whilst keeping that personality) and there were a couple of other nitpicks. 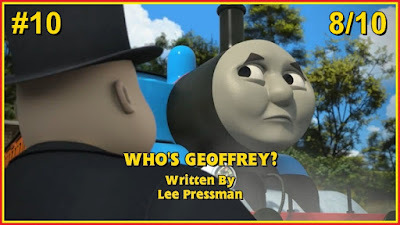 Overall, it's Lee's best episode since Gordon and Spencer (although Bradford the Brake Van is also up there). It made Victor and Kevin's dynamic feel more genuine and it was well paced. 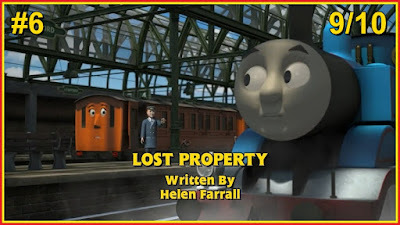 Out of all of Helen Farrall's episodes (and I'm including her series 20 efforts in this), this is probably her least memorable effort. It was just a simple, down to earth look into the railway's general operations, and I appreciated that a lot. And although her future episodes would showcase this better, this one did show that she understood the characters really well and knew how best to use them. Has there ever been an episode that fans didn't know they wanted until they had it? Well I still believe that's the case with this one, and it's a crying shame that they haven't capitalised on this momentum for these two in series 20. 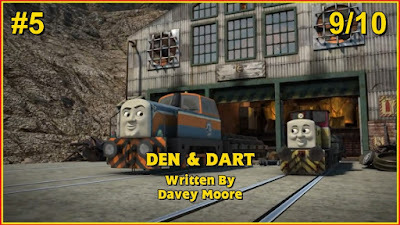 Den went through some brilliant development with Toby's help, Dart had a few nice moments with Mavis and it had a ton of heart and charm. It was fantastic. I'd love to say more about it, but I pretty much said all I needed to in the actual review. The Great Race made this look even better than it actually was. Yes, a 60 minute special made a 9 minute episode look better than it was. Then again, that's probably due to the fact that there was a heavy focus on the story here than the marketing. 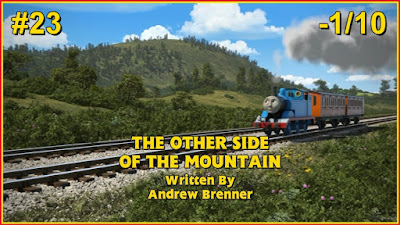 There was a scene with marketing in it, but unlike The Other Side of the Mountain or The Great Race, the inclusion didn't feel out of place at all. It was an excellent showcase of the show's female cast members, the moral was really well handled (despite it being nothing new, even at this point), it had some nice tension (not as good as some episodes, but it was still good), good humour (thanks to Marion). There's little to complain about really. This one, however, had a pretty big complaint. Depending on how much you can tolerate a baby's crying will affect how much you like this one, and since I've a lot of experience with kids on public transport, I have a high tolerance to it. Like other great episodes in this overview, there's not much I can say that hasn't already been said. It just a heartfelt, simple story where Thomas' caring side made a lot more sense. And it also felt like the major starting point where humans were re-integrated into the show fully. Sure, there were other episodes, but they felt more like one offs. 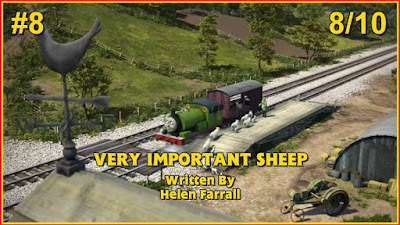 This was one of the last episodes of series 19 to be released, and series 20 has integrated them more than any other HiT era series. I'll be honest, it was so difficult to choose which of these two was the best. Not just because they're full of charm, drama and character, but because the basic stories are fairly similar: a character sees/feels something wrong, other characters doubt them, then it's up to the star to save the day. That said, the stories are different enough to feel fresh, which is fine by me. The rescue team are at their absolute best here, as is Toad, who's become one of the best characters of the show in such a short space of time. In any other series, this probably would have been the best episode. Heck, it was the best of this series until the final episode was released..! Stephen has been an absolute delight since King of the Railway, and it was a shame that he was rather under-utilised in series 18. Thankfully, this episode arrived to show that he still had a very important spot in the show, and that only grew during series 20. It's an episode that also perfectly encapsulates why Helen Farrall has become my favourite writer of the show. She gets the characters completely, and she understands what makes the show so great: the heart, charm, characters, humour and even some brilliant tension and drama. It also helps that the ending was one of the funniest of the show. Fans are saying it's a callback to Wrong Road and, while that's true, there's much more character on display here, making it far superior in every way. 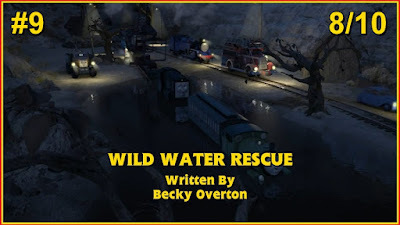 Sodor's Legend of the Lost Treasure and The Adventure Begins were the first projects to implement a new, more natural, feel in terms of lighting. That was carried over to series 19, and it makes every scene look superb. Things now look so much more vibrant and alive, the glossy look of the engines make them look more real and the refreshing variety of camera angles and panning shots made the whole series feel like nothing we'd seen from a CG series before. That's not to say it was perfect; there were still continuity errors and silly mistakes here and there. But considering all the improvements they've implemented, it's not really enough to say the animation was anything less than stunning. There were a few changes to the voice cast this series. Flynn was voiced by Rob Rackstraw as Ben Small departed. He was OK, to be honest. He sounds a bit weird, but he's not awful. That said, I still think Rupert Degas provided the best voice foe the character as he seemed to get Flynn the best. The biggest change though was for Percy. It's surprising enough that Keith Wickham would be replaced in a role, but Nigel Pilkington was brought in to replace him and did a much better job, I feel. He still felt youthful, but he also sounded more natural; less squeaky. It was a great way to complete the development he'd gone through. Toby's voice was fantastic as well. It was a shame to see Ben depart the role, but his performances in series 18 weren't that good. He sounded similar to Ben's normal voice than the accented one he'd use. Rob Rackstraw was a great replacement though. He captured the character and, while not as good as Colm Feore in Thomas and the Magic Railroad, he was still fine. It also helped that his character actually felt right, too. Also, Philip sounded super adorable. Rasmus Hardiker captured his child-like nature really well, and although I found his characterisation rather annoying (during series 19 at least; I've loved him in series 20), his vocal performance never failed to impress. The rest of the voice cast put in great performances, too. They've managed to produce some great material now that the scripts they're given are of a higher quality. Although Henry's deeper tones just didn't fit the scared personality he's had for years, looking back. I'm really glad that he's been developed, and his voice in series 20 fits the character much better. It's a shame that this series turned out to be home of Robert Hartshorne's final contributions to the show, but he definitely left on a high. Sure, the major themes he created were adaptations of classic themes, but honestly, I liked all of the music. They helped tell each story really well (even the bad ones) and they're just really catchy and nice to listen to. @islandofodor --I guess that's why it's set before SLOTLT. While there are bad episodes in there, it also has some of the best too. #TTTES19 is mediocre at best, IMO. When the episodes were good, they were REALLY good, but most of them were awful, which weighs it down. 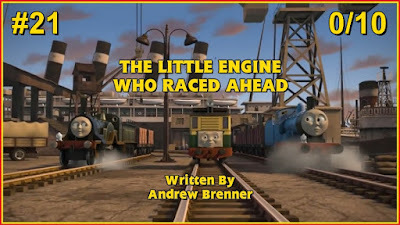 #TTTES19 fantastic episodes such as "Toad and the Whale", "Den and Dart", "No Help at All", "Thomas and the Babysitter", and "Slow Stephen". It's fair to say that this series is a step down from the two we've had before. But I've seen a couple of comments elsewhere saying it's the "worst series ever" and I'm like "...really?". If you genuinely think series 19 is the worst series ever, I re-direct your attention to series 13-16. I know I've written a post putting fans on blast for criticising Sharon Miller for that era, but I'm not naive enough to say I've no idea where the backlash comes from. This one though? I'm not too sure why some are saying it's the worst. Sure, series 17 and 18 are better and this one ended with some really poor episodes, but it's had some of the best ones too. It delved into some dynamics that we didn't know we cared about, the storytelling structure was the best it had been up to that point, it allowed the characters to express themselves more and more and, to add to that, the animation was the constant high point throughout. That said, the fact that it was dragged over a year and a half (unless you watched the Japanese recordings in late 2015) made the wait for new episodes a real chore, and the episodes that were bad could be considered some of the worst since the previous era. In fairness, that isn't really HiT's fault. What is their fault is the lack of continuity throughout. Some engines managed to move after an accident, others couldn't. Characters developed in one episode then regressed in another. This is something the team need to work on in the future. They have been in series 20 to be far, but they need to push further after that. Also, Thomas was far too overexposed. I get this was released during the 70th anniversary (sort of), but the anniversary should have celebrated every character that made the franchise so popular, not the one named character in the title of the TV show who debuted in the franchise in the second book in 1946. Overall, this is more of a "filler" series than anything else. It had some great stuff in it, sure. But in terms of moving the show on, it didn't do much except needlessly develop Henry's character (which, in fairness, has become one of the best aspects of series 20).